Combine the first 5 ingredients in a small bowl. Season chicken with garlic powder, onion powder, salt and pepper, then place chicken in the bowl with marinade. Toss chicken to coat and set aside for 10 minutes before slicing. Grill chicken on a grill pan for 6-7 minutes on each side or pan fry over medium high heat in a nonstick skillet uncovered. Remove from pan and allow to rest for 5 minutes. In the now empty pan, add the bell peppers and onions. Cook until barely softened. Meanwhile, heat the tortillas Turn any free burners on a medium low flame. Place a tortilla on each flame and let it char about 30 seconds to 1 minute. Flip the tortilla and repeat on the second side. Once heated and charred, remove the tortilla to a clean tea towel and wrap to keep warm. Repeat until you have warmed all of your tortillas. Alternatively, you can also heat your tortillas in a microwave, lightly dampen a tea towel with some water and wrap the tortillas in the damp towel. 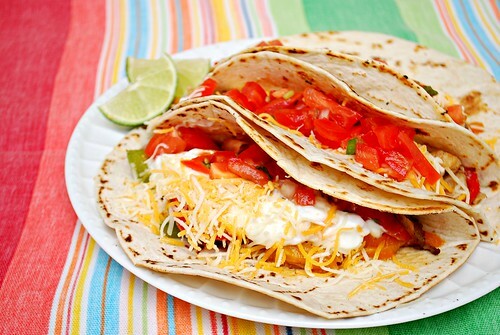 Place the wrapped tortillas in the microwave for 1 minute, checking to see if they are warm. If not, repeat the heating at 1 minute intervals until they are warm and pliable. To serve, place the sliced chicken and a mixture of the bell peppers and onions into a warmed tortilla. Top with your preferred garnishes. Yum! These look and sound delish. We eat a lot of fajitas in our house, and I might just have to try this spin. YUM! These look absolutely fantastic. Definitely perfect for summer. Oh those look delicious! I love Fajitas!! Using fresh ingredients definitely makes it much more flavorful! Oooh, those sound so good! 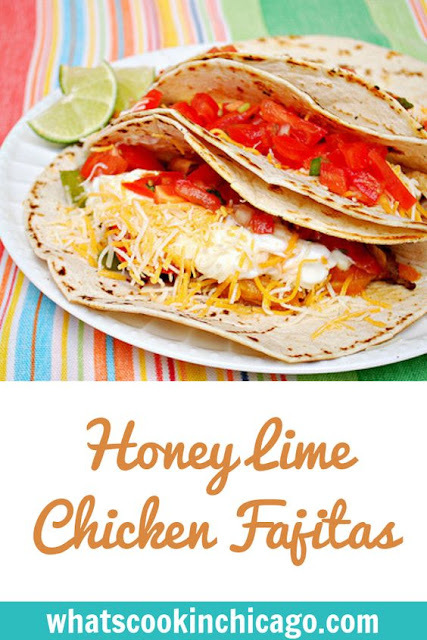 I love chicken fajitas, but never thought to add lime! Oh my goodness those look incredible! OMG delish! I am getting hungry just looking at the photo! I am so hungry and those look amazing. I have lemon juice but no limes, and I want those! Wow, I discover a lot of new recipes. Bell peppers are very good. We're doing chicken tacos this weekend - but not fajita style. These will have to go on the menu for another week!